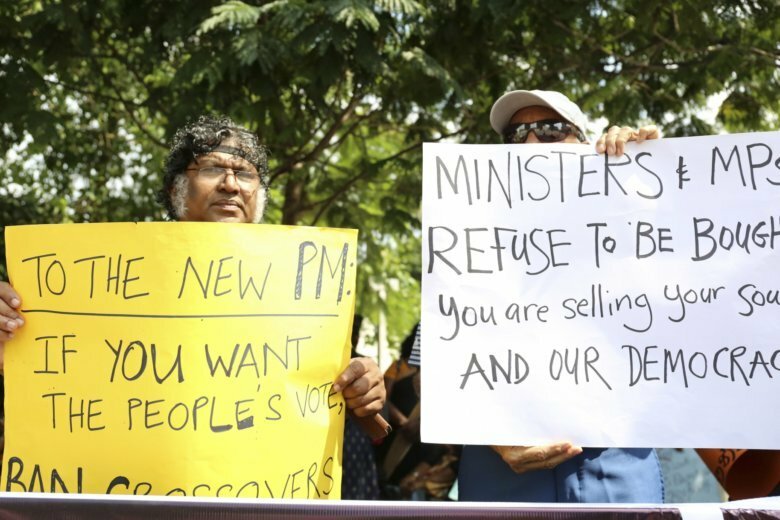 COLOMBO, Sri Lanka (AP) — Tens of thousands of Sri Lankans marched Monday in support of a new government led by the country’s former strongman, highlighting the political polarization in the Indian Ocean island nation. “Give people a chance to choose their government and not hide behind constitutional interpretations,” he said. “I ousted a vision that is incompatible with our local culture and values, and that works according to foreign agendas,” Sirisena said. “Foreign countries are trying to take our resources, take our land,” said Mithra Kumara Jayasinghe, a wedding photographer at the rally who said he had voted for Rajapaksa the two times he was elected president, in 2005 and 2010, and when he lost a re-election bid in 2015. “I wish to emphasize that I am compelled to accept the status that existed previously until such time that they (the pro-Wickremesinghe lawmakers) and the new political alliance prove their majority in Parliament,” he said. “What I ask from all Tamil and (Tamil-speaking) Muslim people and their political parties is to help to build up our country. I trust you and you can always trust me,” Rajapaksa said. “Even if there are threats, pressure and forces, I will only move forward and will not take a step back,” he said.